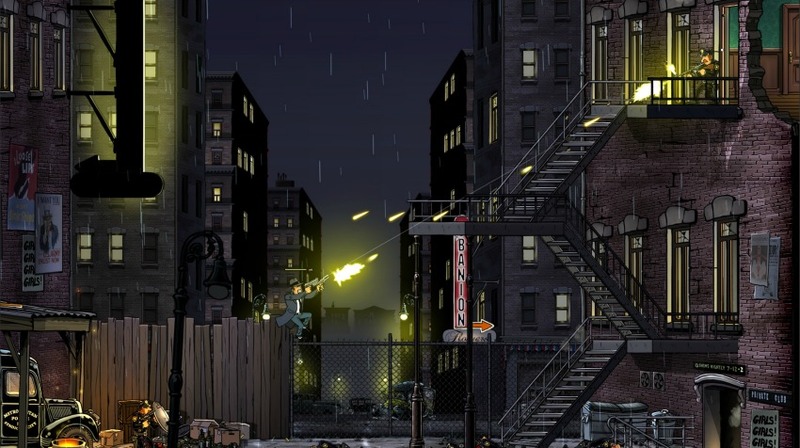 Back in February 2018, we learned that a sequel to Guns, Gore, & Cannoli was in development by Crazy Monkey Studios and Claeys Brothers. Guns, Gore, & Cannoli 2 already made its way to Nintendo Switch and PC, and now the side-scrolling, fast-paced shooting is making its way to Sony’s system. It arrives on August 14, 2018 on the PlayStation 4. The game includes local and online co-op for up to four players, which intensifies the fun and chaos of any given situation. The events of Guns, Gore, & Cannoli 2 take place 15 years after the first game. Vinnie Cannoli is on a European battlefield during World War II. Naturally, this means blasting your way through Nazis. Just like the first game, you can expect a lot of explosions, blood, monsters, and over-the-top action. This time around, Vinnie has a bunch of new abilities. Now you can kick, double jump, dodge roll, utilize 360 degree aiming, wield dual guns, and even customize your character. If you’re looking for a gun packed beat-em-up you can play with friends, this one might be for you. Will you be getting Guns, Gore, & Cannoli 2 when it releases on the PlayStation 4 on August 14, 2018?